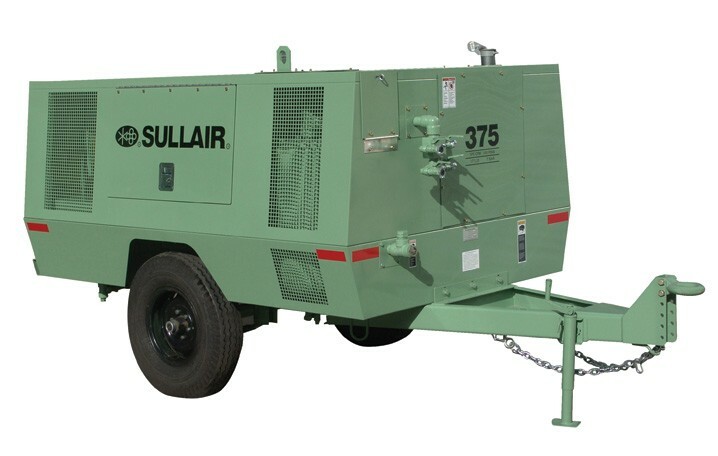 Sullair 375 Interim Tier 4 family rotary screw portable air compressors deliver 300 to 425 cfm at 100 to 200 psig or 8.5 to 12.0 m3/min at 6.9 to 13.8 bar. Available with a choice of Caterpillar or John Deere interim Tier 4 emission-compliant engines, this redesigned product family features an improved diagnostic electronic control system with user-friendly gauges and LCD text display of the run condition and fault codes explanations. Other new features include a full fluid containment retention frame to protect against accidental spills; large, padlockable service doors with gas assist springs that provide easy access to the fuel tank, engine, air filters and tool compartment; and optional forklifts.